The Friends annual Christmas party is scheduled for December 10! Mark your calendars. Details to follow. We will celebrate another fruitful year at the Georgia Museum of Natural History. 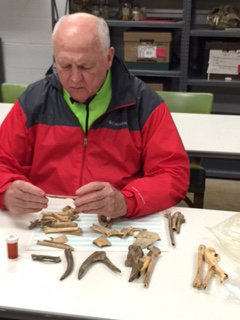 Friends members had an enchanting evening sorting bone relics from the Etowah Indian Mounds. Under the guidance of Dr. Elizabeth Reitz, we were each offered a bag of bone fragments collected from the mounds. We sorted them as best we could, identifying bones of bear, deer, turtle, turkey, raccoon. Dr. Reitz explained the nature of each bone fragment we examined, and illustrated their origin on complete skeletons of the animals in question. We found one deer bone that had been shaped into an awl, a carefully constructed and polished tool. We’re grateful to Dr. Reitz – “Betsy’ – for her guidance. 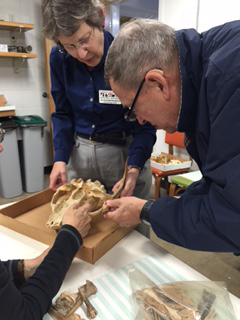 This Zooarchaeology adventure was an “After Hours at the Museum” adventure, one of the benefits of membership in Friends of the Museum.